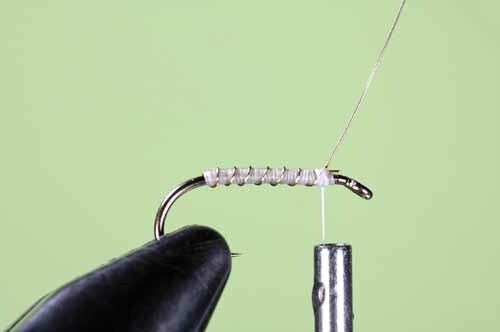 In this section of The Miracle Midge and More, part two, Miracle Midge Tying Steps, Skip teaches you to tie this deadly little fly, and also shows you how to tie its close cousin, Pat Dorsey's Mercury Midge. 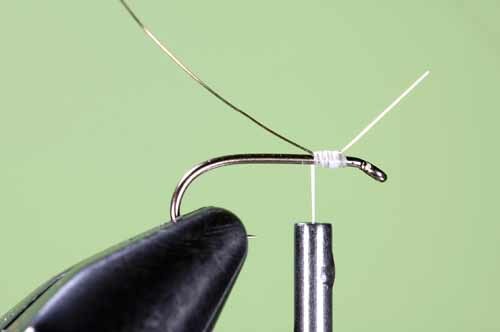 Hook: Heavy wire (or standard or even light wire), short shank to standard length, sizes 24 to 18. Thread: White 8/0 (or finer) for the body; black or dark-gray 8/0 (or finer) for the thorax. Rib: Fine gold (or silver or copper) wire. Abdomen: The white working thread. Thorax: Black or dark-gray dubbing or thread. Thread: Black 8/0 (or finer). Rib: Fine silver (or gold or fine copper) wire. Abdomen: The black working thread. 2. Hold the wire up at a low angle under light tension. Wind the thread down the wire in neat, touching turns to the hook's bend. 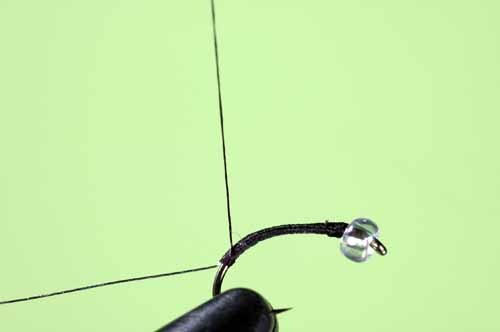 Wind the thread neatly in touching turns back up the shank to just behind the eye. 3. Spiral the wire up the thread-body in four to seven evenly spaced ribs. Bind the end of the wire just back from the eye. Cut off the end of the wire. Whip finish the thread just back from the eye, and trim off its tag-end. 4. Option #1: start some dark thread (dark-gray or black) over the half hitch. 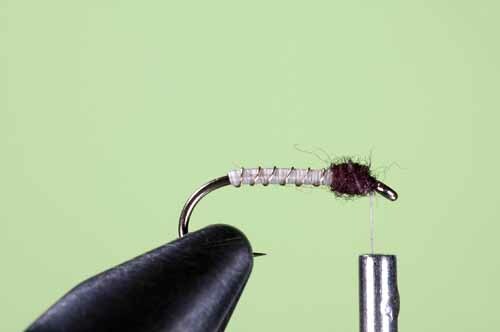 Build the short thorax-area a little with thread alone, whip finish the thread, trim off its tag-end. 5. 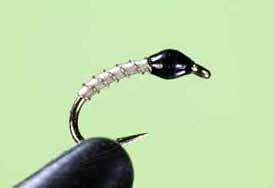 Option #2: start some black or dark-gray thread over the whip finish in the white thread, trim off the end of the dark thread, spin dubbing on the thread and build a short thorax that is a bit thicker than the abdomen. Whip finish the thread behind the eye, and then trim off the tag-end of the thread. 6. Add head cement to the whip finish, if you dubbed the thorax. If you built the thorax of dark thread, coat all the thorax-area and the whip finish with head cement. 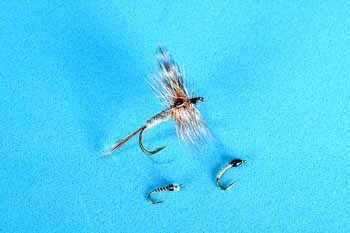 So, that completes the Miracle Midge tying steps. 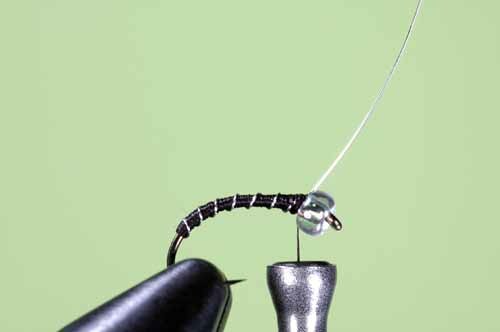 Now here's how to tie the other popular midge pattern Skip discussed, the Mercury Midge. 1. 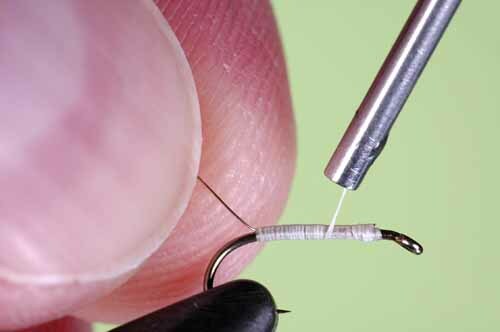 To tie the Mercury Midge, slip a glass bead up the shank of a tiny hook, and then mount that hook in your vise. Start the thread just behind the bead. Trim off the tag-end of the thread. Bind silver wire down the shank to the bend. 2. Make the ribbed abdomen just as you did with the Miracle Midge. Build a slim collar of thread against the rear of the bead, whip finish and trim the thread, and coat the whip finish with head cement. 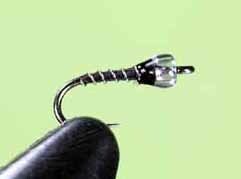 And that is how you tie the Mercury Midge. That concludes The Miracle Midge Part 2, Miracle Midge Tying steps. 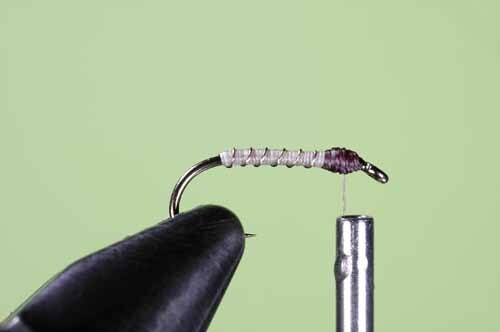 To read about how to fish the Miracle Midge, and for special tips about tying tiny flies, see Skip's article, Miracle Midge and More, Part 1.